Sweaters are a valuable part of your wardrobe. Purchasing new sweaters can be part of the “back to school” clothing buying ritual, even if you haven’t been in a classroom in years. 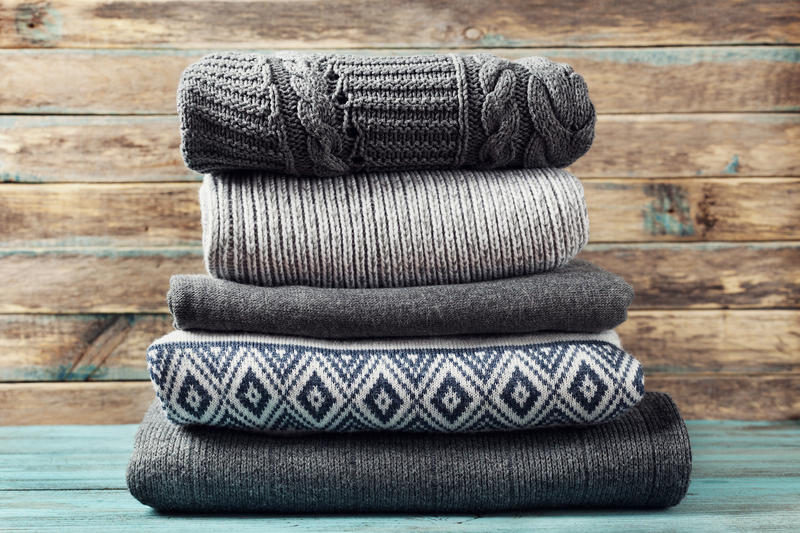 Sweaters range from lightweight to heavyweight, cotton to ramie to wool, fall colors to winter colors to spring colors. They can be pullovers, buttoned, vests, short-sleeve, or long-sleeve. They can be made of silk, angora, chenille, rayon, acrylic, and more. Then there are the trims, such as lace, suede, fur, leather, beads, sequins, appliques, beads, and even snakeskin. We love them all and we love the way you look in them. Purchase sweaters that are the correct size. Tight sweaters will stretch when worn and may not go back to their original size. Loose sweaters are more apt to get snagged. Allow enough room for the sweater to fit over a shirt, if desired. Wool is a popular sweater fabric because it is durable, comfortable, and an excellent insulator. If your wool sweater gets damp, hang it to air dry at room temperature. Do not hang near a heat source, as this will promote mildew. A gentle brushing of wool sweaters after each wearing helps remove surface soil. If the care label suggests hand washing, use cool water with mild soap or bleach-free detergent. Soak up to five minutes and rinse thoroughly. Squeeze out excess water, but do not wring or twist the fabric. To dry, lay the sweater flat, away from sunlight or heat. If using a plastic sweater board as a drying surface, covering the board with a towel (under the sweater) will help prevent snagging. If the care label suggests machine washing, use the gentle cycle. Take your wools, or any sweater with dryclean-only label, to your drycleaner for stain removal. Angora rabbit hair is blended with wool and synthetic fibers to create a very soft fabric. Shrinkage is the biggest problem with angora. Even machine washing on a delicate cycle causes more shrinkage than hand washing. If machine washing is recommended, use a mild detergent since alkali agents can discolor the angora fiber. Hand washing may be safer than machine washing of an angora sweater. When handwashing, use one ounce of a neutral detergent per one gallon of 100 degree water. Lay angora sweaters flat to dry. Chenille is a unique, specially woven fabric that is neither durable nor rugged. Agitation from use, as well as, any mechanical action in cleaning, can create a snagged appearance in this loosely knit fabric. If the fabric looks susceptible to damage, hand wash using a mild detergent. Lay flat to dry, unless otherwise directed by the care label. Do not substitute machine washing on a gentle cycle for handwashing. Even on a gentle cycle, machine washing causes much more rubbing and agitation than does handwashing. Delicate items, such as sweaters, often require special handling. If a stain occurs, do not delay cleaning. Be sure to point out all stains, especially any “invisible” stains – those caused by soft drinks, other liquids, and food. This type of stain is not always immediately apparent, but sometimes oxidizes and appears later. Trims, such as sequins, beads, and leather appliques, can be difficult to clean. According to the Care Label Rule, the entire garment, including the attached trim, must be compatible with the care instructions on the label. When you purchase a garment with trim, ask about the retailer’s return policy. If there is any doubt about care procedures, ask us to pretest a small area to determine how the garment will respond to drycleaning. If there is a problem, the garment should be returned to the retailer for a refund. S. Ray Barrett Dry Cleaners is Norfolk’s premier dry cleaning establishment. We have been in business over 100 years. Our commitment to quality is second to none. S. Ray Barrett Dry Cleaners is a proud member of the Dry cleaning & Laundry Institute (www.DLIonline.org).